Two weeks ago we woke up to a bright and sunny morning in Fort McMurray. The sky was blue and the only sign of smoke was way off in the distance, only viewable from the second floor of Shell Place, way off in the distance up the Athabasca River. I have this memory of piles of ash that had collected on the steps leading up to the Box Office entrance, large flakes that had fallen the day before with "The Beast" was an amusing spectacle up on the hill. We watched with fascination as water bombers and helicopters working on that blaze throughout that Monday. At no point did I consider that evacuation and devastation were even a remote possibility. Two weeks ago, I did a radio interview with Stephen Bryant, Executive Director of the Centre of Hope on a show I host called IMPACT on KAOS 91.1. It was such an amazing discussion and both Stephen and I left the station energized. I remember looking forward to getting the recording of the show so I could listen back to it. About 5 hours later I would be listening to that radio station again, and the soothing voice of Carina van Heerde as she did live evacuation updates and provided comfort during the fiery chaos. I did some running around after that, getting supplies for my painting workshop out at the Mark Amy Treatment Centre near Anzac. This was going to be a large group, 18 to 20 people, and I needed to stock up on canvases, brushes, and various other things. After a quick lunch, I said goodbye to Heather and headed up Beacon Hill and out of town. I remember thinking how beautiful it was and that the fire scare from the two days before was over. 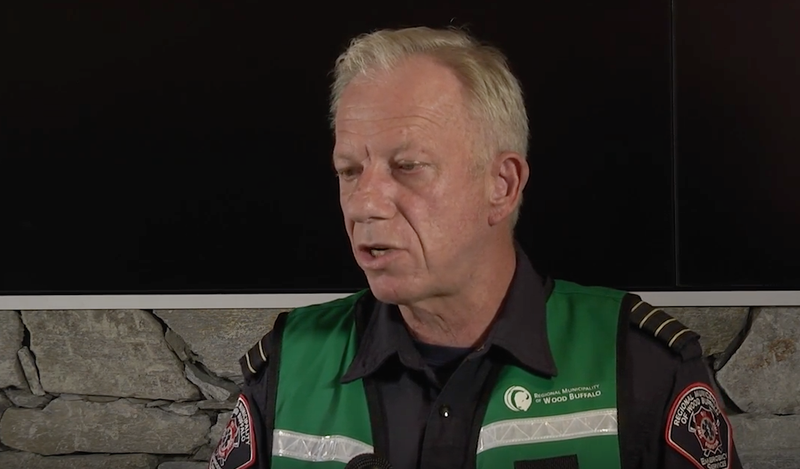 "The primary goal of Alberta Forestry and Regional Emergency Services right now is not figuring out how big that fire is; the primary goal is to figure out how to put that thing out, how to keep people safe, how to project where it's going to go and what we need to do to control that fire." "We wake up this morning and we don't see anything and people think it's fine and it's all gone away," he said. "It's nice to have that thought, but I don't want people to get into a false sense of security. We're in for a rough day and it will wake up, and it will come back." He knew. But could he possibly have known how bad things were going to get 14 days ago? Two weeks along and conditions are almost as bad in Fort McMurray as "The Beast" moved north at speeds of 30 to 40 metres per minute, forcing the evacuation of over 8,000 oilsands workers and several mine sites. The forecast for today is higher temperatures, low humidity and wind gusts around noon. At 7 am, it is already 16-degrees back home. "We're in for a rough day," Chief Allen said two weeks ago today. And while he's taking some much deserved personal time, he's probably waking up and saying the same thing.